A long time ago, The Lands were filled with magic. During this time, The Wizards abused their power and created chaos throughout The Lands. A group of Wizard known as The Ancients was determined to end this chaos and they were able to contain magic by turning it into crystal. Without magic the chaos finally ended and The Dark Time of Wizard came to a close. After long years of peace and prosperity, Irimant the Warlock discovered and broke the magic crystal to return magic back into The Lands. Corrupted by the crystal, the Warlock sends his minions to destroy everything in their path. Join Gallant and his crew to defeat the evil Irimant. 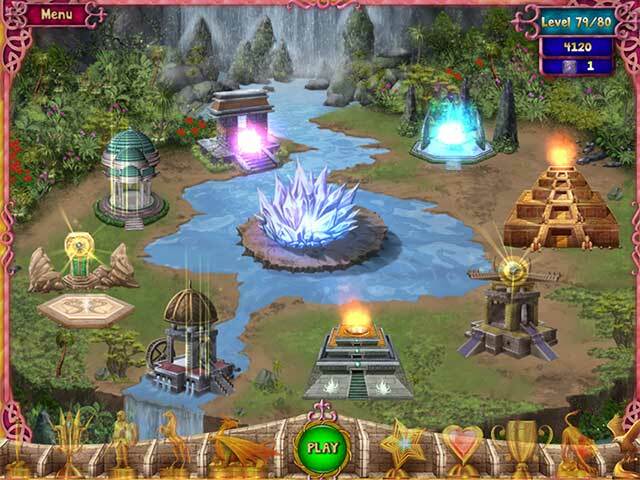 Help restore the peace in a land of wizards! 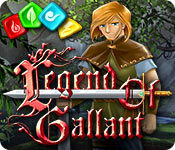 Legend of Gallant is rated 3.2 out of 5 by 19. Rated 3 out of 5 by petergee from I wanted to like it but... After playing the demo, I am totally undecided. As it features my surname I really wanted it to be good but it wasn't. It is a match three/four/five/six game which you clear the underlying blocks and capture (drop to the base of the gameboard) other objects. There are some nice features... different obstacles to clearing the blocks/things and they fall ( with the other blocks) as well which is a good thing - more of a challenge but generally there is nothing much to go wow about in this game. It's a so-so game ...not good ...not bad. So you are left undecided as to whether to recommend it or not. I don't think there is enough to make it better than an average game, so would have to drop on the don't recommend side. Try it and see - you need to go past the first few levels which are rather easy. Rated 3 out of 5 by fredandethel from Pretty little match 3 Based on 35 minutes play: The introduction, which I thought was quite an original storyline, and the characters are cartoony, but the backgrounds to the game are sharp and detailed - very pretty. 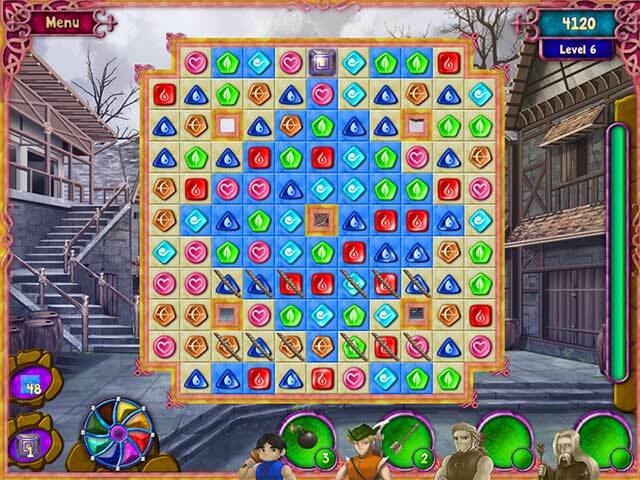 The game itself is simple, make matches to remove background tiles while lowering objects to the bottom of the board. No challenge, at least in the levels I played, unless played timed which I never do. Match 4 to get a 3 by 3 square bomb, match 5 to get lightning which takes out an entire row. Any match goes towards filling an amulet which seems to take out random tiles, including the ones you need. Other powerups appear automatically as you go along. Not for me, but try it for yourself! 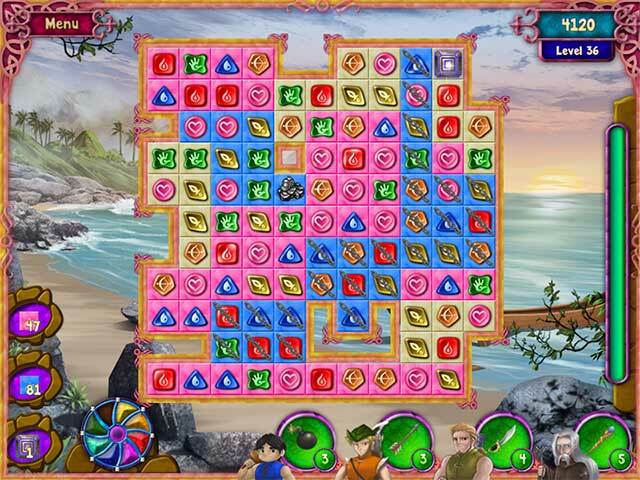 Rated 2 out of 5 by Mermaid1950 from Match 3 This game is boring, no challenge, if you like a challenge then this game is not for you. Rated 2 out of 5 by seboopsie from Dull - No challenge, nothing special, no fun. The good: as match 3 mechanics go, game play is acceptably smooth, responsive and quick (always a shame when a match 3 fails on this very basic level). The bothersome: Graphics and music are a snooze and after "building an alter" and hitting play before it was complete I was treated to the sound of little pounding hammers throughout the entire next level until I quit and restarted the game. The bad: I played the demo (39 minutes of it) on timed mode and there was quite literally no challenge at all. I made all times easily without using a single off grid power up and frankly started to avoid using the power ups given on grid until they were just in my way in an attempt to create some kind of challenge. I would say that it might be decent game to for kids stuck between cutie kid/adult games, but there's just nothing fun about it. Rated 1 out of 5 by pasmo from Didnt like You only receive 1 credit in the majority of levels and since it takes 15 credits to build an altar you can see how long it takes to accomplish this. Seems to me as levels get harder the credit points should increase not stay the same. Rated 1 out of 5 by michal95 from Match 3 in Slow MO Have never seen such slow action in a match 3 game. And someone should give the creators a dictionary. Rated 1 out of 5 by yelwbkrd35 from A tale of 2 games whoa! This game is so all over the place with graphics, music and challenge I found myself laughing at how ridiculous game play is. Mid evil theme that breaks into calypso music? The tiles get tiresome rather quickly without a change at least thru the demo. I usually don't write a bad review yet this one had me shaking my head the way the dev threw in maybe "left overs" from abandoned games. Game board moves in slow motion compared to the music. It was like being lulled to sleep. I didn't finish the demo at that point. BF I think you've been in a serious drought lately to put out a game like this.